This giant of a gift tower makes a huge impression! It features a set of 5 keepsake boxes, each with a festive holiday design, packed full with irresistible treats for the holiday! What a fun and fabulous gift to give to a large group of people (or even yourself-wink)! This gift basket isn't just large (over 2 feet tall) and beautiful; it is filled with some of our finest holiday gourmet gifts. 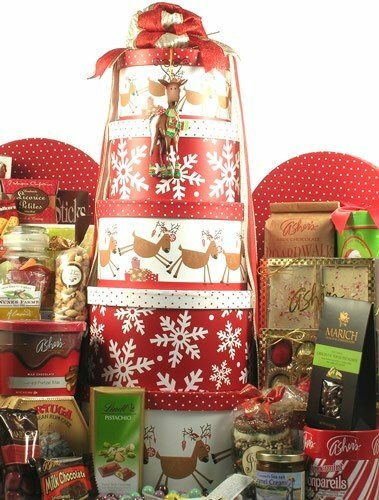 This over sized Christmas tower includes the following: Keepsake Reindeer Ornament, Top Box: Assorted Chocolate Covered Gourmet Pretzel Twists, Coconut Curry Cashews, Natural Dark Chocolate Sea Salt Caramels, Chocolate Crunch Cookies, Second Box: Tortuga Caribbean Rum Cake, Licorice Petites, Honey Cinnamon Almonds, Buttercrunch Toffee with Cashews, Lindt Pistachio, White Chocolates From Spain Third Box: Chocolate Espresso Beans, Chocolate Cherries, Almond Buttercrunch Toffee, Peppermint Bark, Milk Chocolate Boardwalk Crunch, Milk Chocolate Smothered Graham Crackers, Dark Chocolate Smothered Sandwich Cookies, Berry Chipotle Snack Mix, Tin of French Roasted Coffee Bonbons, Fourth Box: Chocolate Walnut Fudge, Dark Chocolate Almond Godiva Bar, Dutch Chocolate Dessert Twists, Peppermint Nonpareils, Milk Chocolate Covered Pretzel Bites, Latte Brew Snack Mix Bottom Box: Snickerdoodle Cookies, Irish Cream Chocolate Truffles, Cranberry Chocolate Drizzle Cookies with White Chocolate, Peanut Butter Filled Milk Chocolate Mittens, Chocolate Toffee Pistachios, All Nuts Mix, Smoky BBQ Snack Mix, Jar of Sea Salt Caramel Cream, Butter Shortbread Finger Cookies, Hazelnut and Mint Truffles, This large holiday gift tower would be a perfect holiday gift from one office staff to another, or make a nice gourmet Christmas gift for a whole family. If they love gourmet tasty foods, they'll love this gourmet Christmas holiday gift basket! This giant of a gift tower makes a huge impression!